I was so excited to start working on this one. 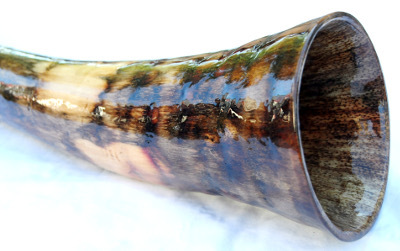 The shape, bell, thickness of wood, and resonance are just tremendous. I love these Old Souls and this one definitely has some stories to tell. It is a rhythm machine and is so responsive to the player. It plays with ease and power and inspires so many new ideas. This would be so great to accompany other instruments with its volume and also it would be a great performance didge. I love the coloration throughout and in person you will see so many more pigments and the pics don’t do it justice . 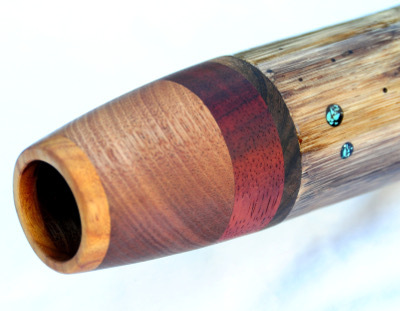 Along with this, the mouthpiece and turquoise inlays throughout add so much beauty to the stalk. With the ease of playability, power, and beauty of this stalk it is sure to inspire new rhythms and sounds!